adaptiveblue is a Firefox extension that promises to make life easier for the packrats of the world, which includes most people. It's like social bookmarking except you store the bookmarks in your browser though I haven't seen it described that way on the site itself. 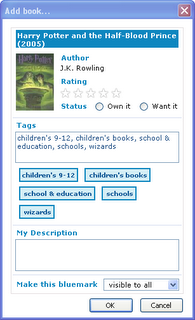 You can highlight and "bluemark" text like movies, books, restaurants, or cars. adaptiveblue recognizes "objects" in a page like books or even wine and can automatically pop up a list of information associated with that object if the site you are on is supported by the extension. These bluemarks are automatically created for you with all relevant information like author name, tags, and rating. You can share or publicize your bluemarks as RSS feeds so your friends can see what you're interested in. While the tagline says "the web your way", adaptiveblue really isn't at the point of offering personalization services like suggesting what books you might like. It's more like a bin where you throw in all the stuff that interests you, but it auto-categorizes everything so you can find it all again without too much difficulty. The cool part is the auto tag generation which del.icio.us and other social bookmarking services definitely need to look into. It takes a bit of work because the service has to parse through the page content and extract context sensitive keywords, but as shown by adaptiveblue, it's doable even if only on a site by site basis.